In June we announced updates to the Office 365 user experience, including a simpler and more powerful Outlook on the web, which would show up later in the summer. Starting September 10th, we’ll roll out an opt-in toggle so users in Targeted Release can try this early version of the new web experience. Users who try this early version of the new Outlook on the web can go back to the classic experience as often as they want. Users who are in Targeted Release will see “Try the new Outlook” next to the toggle and can opt in (and out) of the trial as often as they want. However, we also want to ensure that admins can control whether their users see this toggle. 1) Connect to Exchange Online PowerShell. 2) Review the OWA mailbox policies that have been created previously. To do this, run Get-OwaMailboxPolicy. 3) This will output all the policies that have been created. If you have multiple policies, you will want to adjust each policy that you want to block the new experience opt-in toggle. After this is complete, Outlook on the web will honor the policy and not show the “Try the new Outlook” toggle. If you want to know more about the new experience, please review this post. We’re looking forward to you trying the early version of the new Outlook on the web. Thank you for providing a switch so that organizations can control the end user experience. @Gabriel Valdez Malpartida Can Set-OwaMailboxPolicy be scoped to a subgroup, so that some in the organisation can access the toggle and others not? e.g., can we roll it out to a smaller test group and block for everyone else, or is the policy global and singular across the tenant? It has been a week after the announcement but still no opt-in toggle for our target release users. Missing "Reply All by Meeting" with new Outlook Web App. Can this be done through the settings in Outlook? @Chantell McIntoshnot from what I can see so far. Hoping that in a later code release this becomes an option that the end user can make. I am not sure if it is the right place to ask this but can someone tell me why MS has removed the open other mailbox option from web outlook in this new version? and how users will be able to open shared mailboxes? Is there a preferred place for feedback, feature requests? Got the toggle yesterday. I like the new changes. There's something about a web client that seems more efficient than my full Outlook client. I find myself using the web Outlook more often. Do others find themselves doing this also? ^ @James Taylor - I like the Outlook web client as well and find it more efficient. The only reason I have had to use the thick client is when clicking on an *.ics file for a calendar entry it automatically fires it up. Only knocks so far with the preview is the "Open another mailbox" option is missing and I really really want Microsoft to consider adding the "Delayed Send" option to OWA to negate the need to have a client and it being open for this function to work. you say "complete the following steps prior to September 10th, 2018"
What if i do it now (after the 10). My OWA policy will block the new experience test ? I still don't get the access to the 'files' tab, I'm assuming this function is not ready yet? But on outlook.com it's available. Can anyone else add a shared calendar to the list of 'Other Calendars' or 'Shared Calendars' in the new Outlook preview? This gives you an experience kind of like the "open these additional mailboxes" advanced account setting in desktop Outlook. I haven't found a way to open a shared mailbox in a separate browser window, though. @Gregory Neumarke - I wish I could give you 10 likes.... It works!!! And, it' s one more major step to being completely OWA. But there is still no file tab in the main inbox. However on the screenshot in this forum the 'file' tab is clearly there and I know it's active on outlook.com so why haven't they activated it here??? Hello everyone - Thanks for the comments, questions, and feedback! As well as the good responses! I'll try to respond to as much as I can in this post. 1. Targeted Release allows the admin to select which users actually have TR. So, an admin can set TR only for a number of testers without the rest of the org getting the toggle. This of course, assumes the tenant/org is not in TR. 2. Browsers - We've found that each major browser behaves differently. Chrome will open one new tab the first time you click on each module (Mail, Cal, People) and then keep coming back to those, Edge opens as many tabs as you open (so if you have Mail, open Cal, and then from Cal open Mail, Edge will open a new Mail tab), and Firefox stays in the same tab when you open/click on each module without opening more. We're investigating. 5. The file tab is coming soon. What you see in Outlook.com is a photo tab, so it only shows photos that you've sent/received. The Files tab in Outlook on the web will show in two different lists, all files and images. Sorry for jumping in late, I am still digging myself out of post-Ignite emails. I hope this helps and please, let me know if you have any other questions. Is it the intention that this 'new' outlook experience will become the default Outlook Web experience, or will it remain an option ? No 'delayed send', the 15 second countdown. It's in the current web client, why on earth remove it if it's not a UI issue ? 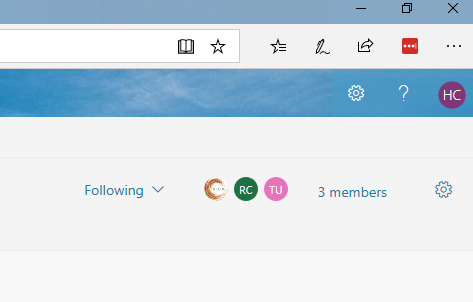 Groups display no longer shows the group's picture / avatar. I'm a member of a lot of groups. Taking away that simple visual indicator and reducing it to a list of text slows me down considerably in navigating my groups. Folder lists are now more distracting with the compacted layout with bold (subject) and blue coloured recipients. That's the experience I finally got away from when I stopped using the fat desktop client ! Overall it seems like useful features and settings have been removed, perhaps to simplify things for MS, but at the expense of usability. The UI has been dumbed down to be closer in look/feel to the fat client. When Google introduced Inbox I went over to that for a while, but pretty soon came back to Gmail for very much the same reasons of preference for a cleaner UI with no features that attempt to manage my email for me in a 'smart' (ie. I get less control) way. At best please continue to give us a choice now that many of us here in my organisation have adopted Outlook web as our sole email client, not least on the basis of the cleaner UI. There are a) very few posts/ideas on there and b) you can't add new ones. BTW - this fault lingers even after you switch back to old OWA. They profile pictures do occasionally come back. Have spent 30 minutes trying to work out what I'd broken. I would like to revisit the question about option to 'open another mailbox' being missing from the menu when you click on your picture. There are valid reasons to open another mailbox in a new tab vs just adding as a shared mailbox on the left side of the screen. Right now you can still choose to try 'The new Outlook', but I am afraid that one day soon it will permanently take effect and that this option will still be missing. Can anyone indicate if this feature will be put back and/or if there is a different way to accomplish that I have not discovered yet? Open another Mailbox is the single biggest missing feature for my org. Admins use it 50 times a day, and we have hundreds of users that use it many times a day to open shared mailboxes, or boxes of associates that they have access to, etc. I know people like to say things are crucial and showstoppers and I try to avoid that when possible, but this truly would prevent us from being able to move to the new Outlook. The Teams meeting integration was the first step, we are now rolling out the option for users to be able to select between a Skype and Teams meeting, assuming users have both services enabled by their admin. Will the ability to "open a calendar" be available on the new version of OWA anytime soon? (ie view calendar of an O365 resource/room)? Exclent opportunity to test out some features for new capabilities, but would like to see more flexibility to allow an organization to control availability. In fact, all Global Administrators should be invited to participate on an earlier trail so that it provides an opportunity to review and provide input before such a scaled deployment. New Outlook experience has been unusable for me over the past couple of days. Incredibly slow - unusable. Have had to switch back to classic version which is working fine speed wise. The new Outlook is nice looking, but the web version STILL doesn't have desktop notifications. I do see a red dot on the favicon on the browser, but that's all. I run Thunderbird in the background to get a notification. Gmail has had this for years. Users have been asking for it. Why does Outlook still not have this functionality?? ?